Welcome to spring - hopefully. I would like to thank all those that brought goodies to share on Rally Day. They were delicious. I also need to clarify a mistake made in the CWA information - my doing - as to when the judging for the CWA will be held. 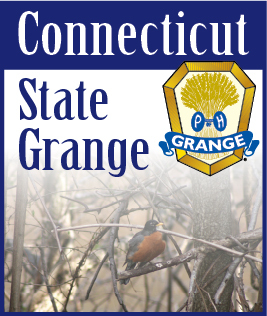 It WILL be held on Saturday, June 11 when the entries need to be at Cheshire Grange Hall by 10 a.m. They will be available for viewing on Sunday, June 12. Hope this clears up any confusion. If anyone has items for the store at the Big E and you would like to get them out of your house, they can be given to Betty Jane, myself or any member of the committee. Something new this year the CWA/Family Activities Committee will be in charge of the Hospitality Room at State Session. We are not collecting anything yet, but keep it in mind for down the road.